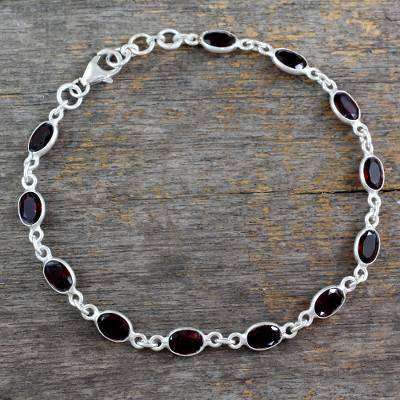 Garnet Tennis Bracelet Sterling Silver Handmade in India, "Romantic Red"
Faceted to increase its allure, garnet, the birthstone of January, forms a crimson chain. Bhavesh's design encases the romantic stones in silver, linking the gems in a dazzling bracelet. You can find garnet tennis bracelet 'Romantic Red' by Bhavesh in jewelry categories such as Birthstone Bracelets, Garnet Bracelets, Silver Bracelets, Sterling Silver Bracelets and Link Bracelets. Enjoy exploring these sections for other Novica treasures. This bracelet is high quality, comfortable, and goes with everything. I wear it a lot! I was so happy to find this bracelet was just as lovely as it appeared online. Am so pleased, this will definitely be a favorite piece. This bracelet is a beautiful piece. I shy away from anything big and ornate and this is the perfect one for me. Very well done! "now part of a beautiful set"
Very delicate, but beautiful. However, much smaller in actuality. matching the other garnet purchases made from Novica. A delicate bezel set collection of garnets to enjoy and treasure. "Beautiful and a great value." Love this. Bought it as a January birthstone gift and love it so much that I now want one. It looks like I spent twice what I did. The quality is excellent. The fact that it is adjustable made it a great gift since I didn't have to worry if it fit. The fi I would highly recommend it. Bought this bracelet as a gift for Christmas ( last ) and was surprised when I opened the box to view the item. Much prettier than it shows here online. The stones are a beautiful red color-not cinnamon brown red. And the silver shines to add a spectacular look on the wrist that can be seen across the room. A stunning piece of artisan simplicity in design and quality. Highly recommend. The recipient was very pleased as well. She loves it. I absolutely loved this piece and it was the perfect gift for my best friend and bridesmaid. She loved it and it fit her wrist perfectly. The cratsmanship is exquisite and durable and arrived on time. You can tell the artist takes pride in their work! It came in a beautiful box with information on the artist and I gave it to my bridesmaid so she could tell others. Definitely worth purchasing for yourself or as a gift. I would buy it again!